Home 2018 Bathroom Trends	Barn Doors for your Bathroom En Suite Entrance! Is this you? … you’re looking to buy a home and everything you’re looking at seems to not have a door leading from the Master to the En suite…Is this a trend with builders or what? What if this is your existing home and you want to update? Well here’s an option to consider. We had an awkward transition (or, more accurately, the lack of one) between our master bedroom and bath. Actually our sink area was completely exposed to the bedroom, really just all part of the same room. Our home was built in 1974 so I can understand the design. So what to do? We wanted a relaxing retreat, and having the place where we wash our faces and brush our teeth, right? I’m sure we weren’t alone in this and so I’m going to walk you through some ideas to update even the most dated bathroom entries. 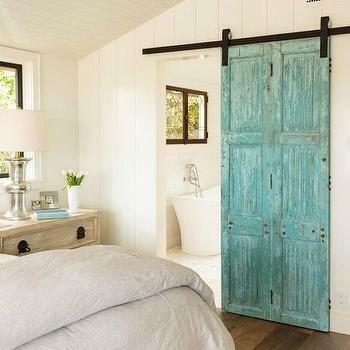 Have you considered a Barn door? 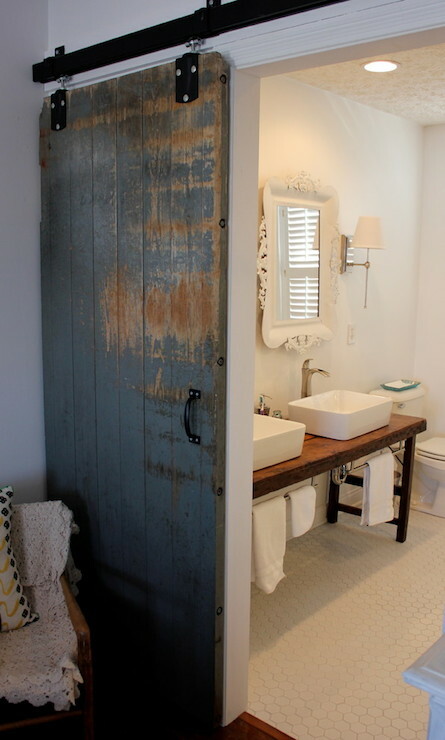 A Barn Door might just be the answer you need to give you the privacy you need with an amazing design update! But there’s a lot to consider before you decide to jump into a project. I’m breaking it down for you in five steps so you can decide if a Barn Door will give you the answer you want. 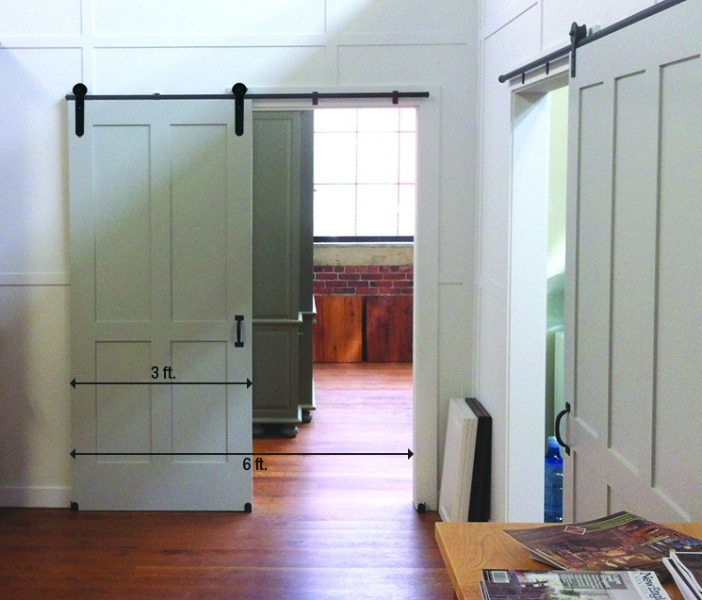 A barn door can free up space compared to a swinging door, but it also needs room to slide along its track. If you’re mounting a single door, you need wall space on one side of your opening that is at least the width of the door, so it can slide completely open. For double doors you need wall space the width of an individual door on each side of the doorway. Make sure the wall has no light switches, outlets, windows, vents, doors or artwork that might impede the door or scratch it as it slides open. Barn doors can be heavy – up to 200 pounds or more, so for sturdiness, most people mount the track to a header, attached to the wall studs, above the doorway. A 2 x 6 cut as long as your track should do the trick. If you mount on wall studs, be sure there is a stud or wood block at every interval on your track, including beyond the door opening. Wall anchors are not sufficient support for hanging these doors. Bonus: Mounting your door to a header positions the door far enough from the wall to clear the door frame and trim when sliding. In the photo below, my Doug built the header but we also created a foot more space in the bathroom by building a false wall. It is not load bearing, but merely a wall framed out to give us more square footage in our bathroom. For us it made all the difference and we didn’t notice losing a foot of our Master Bedroom at all. Barn doors hang from a track outside the room, covering the doorway, but leaving gaps at the sides between wall and door. For complete coverage and to minimize the gaps, make sure the door is at least several inches wider than the opening. For example, a 4-foot door will cover a 3-foot opening with 6 inches on either side, reducing the gaps. Buy a track that’s twice the width of your door: A 4-foot wide door takes at least 8 feet of track to slide completely open. For wider doors, cut the track to fit and join the pieces with connectors available from the hardware manufacturer. Your barn door will be a focal point in your home, so it needs to look great, perform flawlessly and hold up under the wear and tear of everyday use. High quality hardware is durable, moves smoothly and quietly and beautifully complements your décor. You would be surprised what you can find online so do your homework and really shop around. You can find great hardware for any budget, but elaborate hardware will cost a bit more. A handle or pull lets you slide the door open and shut easily, and it looks great. This works on the outside, but you’ll need to install a recessed pull on the inside so the door clears the door jamb when it slides open. If your barn door is the entry to a bathroom or bedroom, you’ll find different privacy latching solutions available, from a hook and eye closure to a latch with strike plate – even a decorative deadbolt will work. Now you’re saying I don’t have a Doug…sorry he’s one of a kind…but if I want to know how to build and install my own Barn Door without breaking the bank so I’m providing a tutorial on YouTube so you can see if it’s something you want to tackle or whether you need to hire a professional. Barn Door Tutorial . 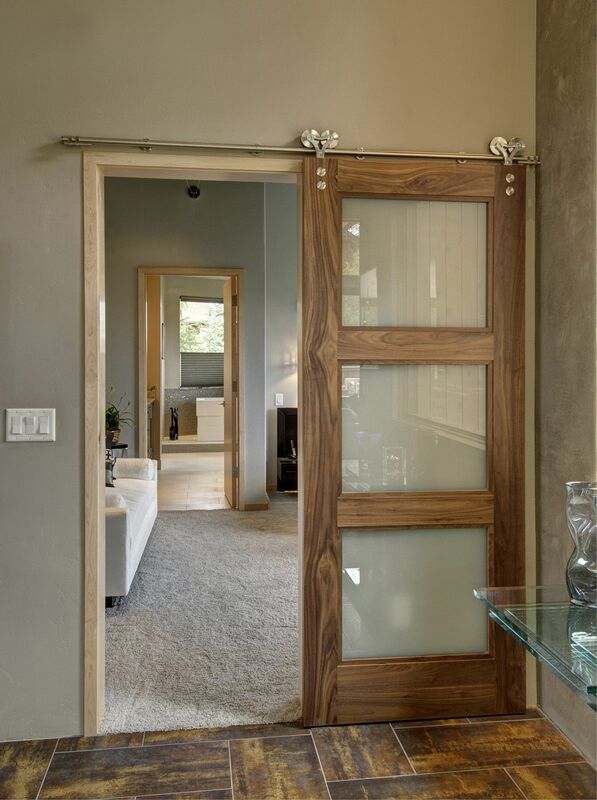 Barn doors don’t need to be rustic…love this modern barn door! How about using an old door…will that work? Yep! 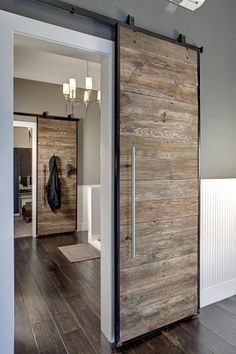 How about modern glass and wood Barn Door? 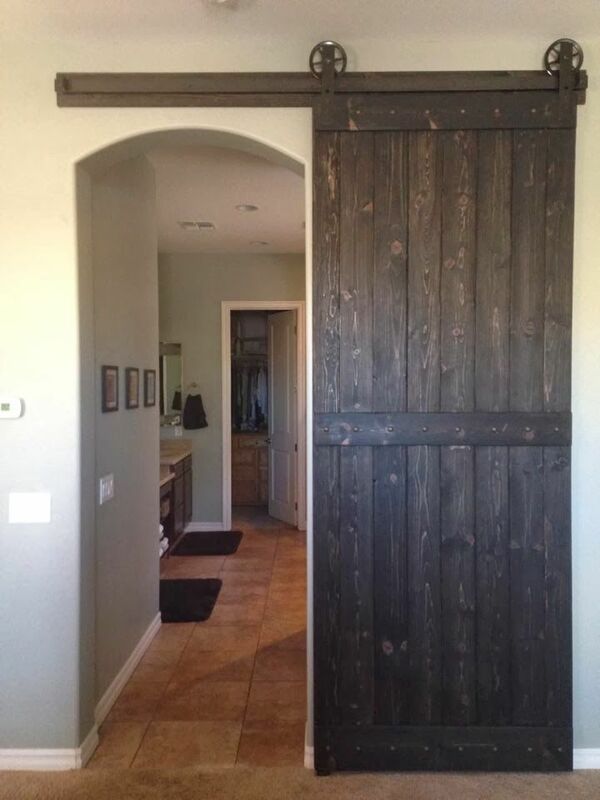 So is a Barn Door in your future for a new home purchase or your existing home? I hope I’ve given you some great information and options to think about! And if you need anything…we’re always here for you! 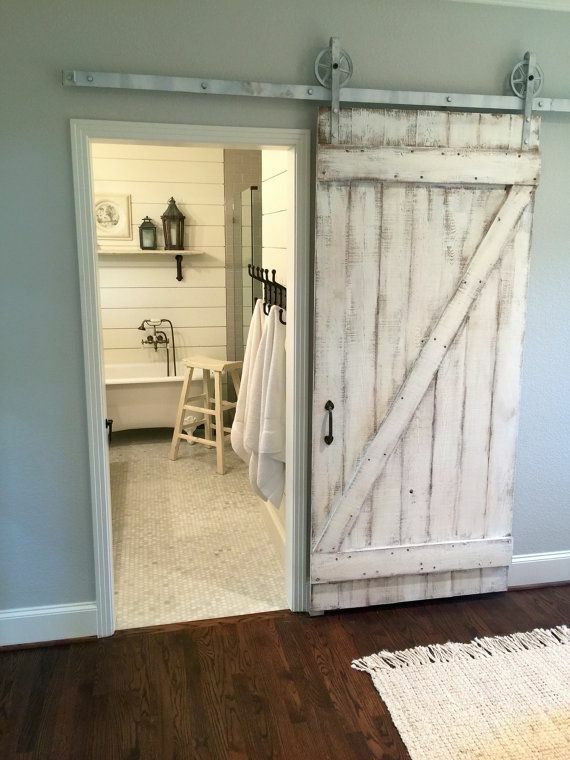 Are Barn Doors for You? ?